Britannica provides over 1600 LaunchPacks covering the Humanities and Social Sciences, and 1800 for the Sciences. Organised into manageable topic areas, these pre-made collections of articles, images, videos and primary sources help to support learners. Multi-modal learning supports your curricula, with all content combining to improve the learning experience. Created to be appropriate to students’learning levels and encourage productive research. Annotations can even be added by students or teachers to increase comprehension. Each pack can be customised to be used to enhance learning. You can change, add, remove and schedule content to meet teacher and learner requirements. Spend less time sourcing interesting information relating to your Social Science lessons with our pre-made collections of resources. How can I download more information? How can Britannica LaunchPacks support our institution’s research goals? Does Britannica LaunchPacks support English language learners? Can an individual leave notes in a LaunchPack? Can I copy or reuse content in my own work? How can we integrate Britannica LaunchPacks? How can Britannica LaunchPacks support our institution’s research goals? 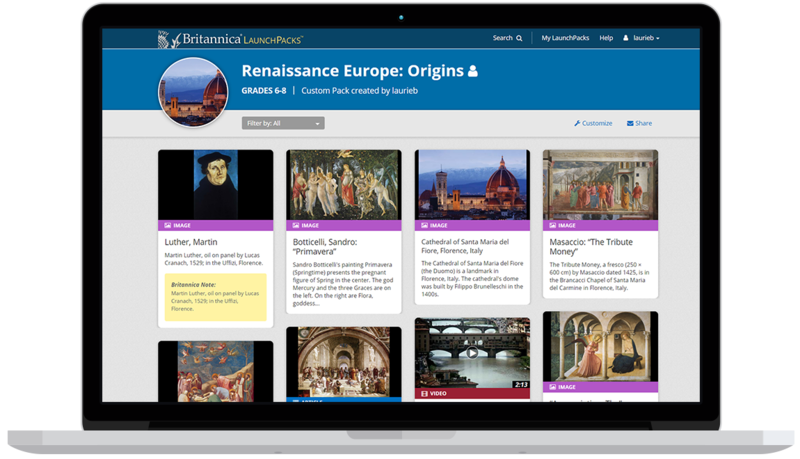 Britannica LaunchPacks provides over 3,000 up-to-date and easy access pre-made collections of content and can save time for both teachers and students across all education sectors. Does Britannica LaunchPacks support English language learners? Britannica LaunchPacks provides text-to-speech, video and audio multimedia assets, Merriam Webster’s double-click dictionary and thesaurus. Additionally, Arabic and Spanish readers can benefit from our unique 98% contextually accurate, on-demand translation of any word or phrase. Can an individual leave notes in a LaunchPack? Yes, all of the LaunchPacks can have annotations added to them, by teachers and students to highlight particular areas of interest, ask questions, or to remind learners to include sections in exams, revision or coursework etc. How can we integrate Britannica LaunchPacks? Depending on your requirements, we can provide access by username and password, IP authentication, URL referral, EZ Proxy, Shibboleth and Athens. Britannica can also be used remotely. For further technical support, please contact Britannica on +44 (0)20 7500 7800. This service is available Monday through Friday from 9am to 5pm UK time.